In the technology sector, businesses often have to deal with extremely complex product, software and service orders, which can prove challenging for most sales teams. If you haven't got efficient processes or systems in place to deal with large-scale, multidimensional orders, it can have a negative impact on your reputation and cause deals to fall through. Walpole Partnership explores the top sales challenges for businesses in the technology industry and outlines the solutions available. Establishing a smooth sales process within your business is vital for growth. There are numerous points throughout the customer journey where opportunities can be lost if processes are not watertight. Sales automation saves time, prevents leaks from occurring and increases efficiency. 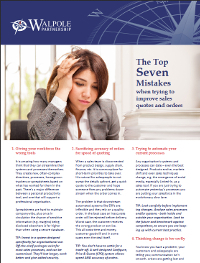 We’ve been talking to many sales managers and business leaders lately and we realised there’s a consistent set of mistakes that are made when people are trying to improve their sales quoting process. We’ve condensed our findings into an easy to read summary. Click here to learn what we discovered, and our tips for how to avoid making the same mistakes.